Following a phenomenal set at this weekend’s Download Festival, Anathema have announced their headline tour of the UK in September, in support of their brand new album ‘The Optimist’. The band will be joined by be accompanied by French blackgaze pioneers Alcest ( www.facebook.com/alcest.official ). Music is a very personal thing both for the artist and the listener, motivational, inspirational, a catharsis on which a musician can bare their soul and the darkest secrets within. It has always been about emotions, happy or sad, a conduit through which a musician can come to terms with the past and look forward to the future. 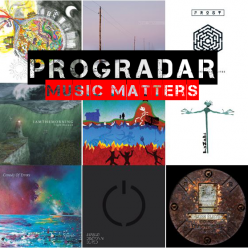 An outlet affording the chance to confront fears, battle them head on and come through the other side eliciting empathy from devoted fans who recognise the difficulties faced in bringing the music to life. Artists can quite often be protective of their private lives, yet willing to lay raw past experiences and struggles still faced. We have seen some fall by the wayside, being unable to exorcise their inner demons, yet at the same time others find salvation in their music. 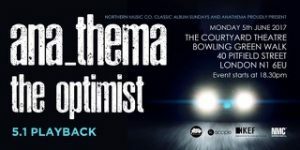 So it is with Anathema. 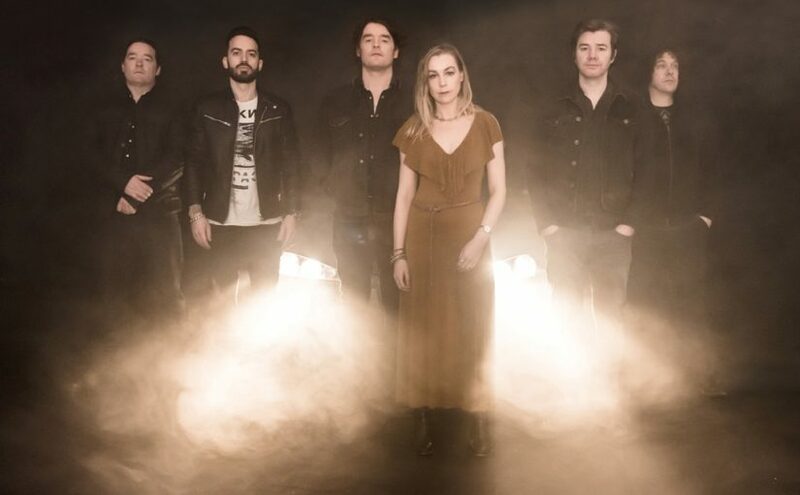 They too have had their trials and tribulations, most recently Daniel Cavanagh’s publicised personal struggles, after the well received previous studio album ‘Distant Satellites’. A hiatus over the last twelve months to recuperate and enable him to return to some semblance of normality has led to a moodier album. Thematically picking up from 2001’s ‘A Fine Day To Exit’, the new album sees the band lead us down a darker path, which whilst the music guides you it doesn’t provide answers. I checked the coordinates of first track ‘32.63N 117.14W’ it gives a location on the west side of Silver Strand State Beach, along San Diego Bay. So I take a turn off the free-way at Chula Vista and drive the Chevy round there. I arrive in time to see some John Doe pulling himself from the surf like a wet rag and stagger his way up the beach. I’ve no clues as to who our protagonist is so I decide to sit back and observe. I roll the knob on my car radio and slip through the channels, there’s a tune, I recognise the band but then lose the reception. It’s replaced by catchy digital style beats and my fingers drum on the steering wheel in time to the rhythm. The man climbs into the passenger side of a Buick which has pulled out of the Loews Coronado Bay Resort (as guitars kick in) and exit the kerb. I throw the old girl into gear and pursue at a steady distance the voices joining the tune on the radio sound familiar, urgent, but I ain’t got time to think on it further as they speed musically away from my car, they are ‘Leaving It Behind’. It occurs to me the pair may also be fleeing from some sort of trouble. I step on the gas and close the distance as we cruise the 75 past the Naval Amphibious Base, Coronado and across the bridge. They approach a spaghetti like junction and could go ‘Endless Ways’ but heading for the 14A their car slides on to the I-15N, through San Diego and out past Little Italy settling at a steady speed. I notice it’s some blonde dame driving, a pretty little thing. The name Lee comes to mind and I’ve seen her but can’t place where. She has the window down and is singing to the guy beside her, the words float through the balmy air toward me, the broad sure can hold a tune and clearly doesn’t want him to leave her and the dream she’s creating, lucky guy. Over Ocean Beach Free-way skirting Enchanted and De Anza Coves we bypass Sorento Valley, this could be a long drive. The no name, let’s call him ‘The Optimist’, in the passenger seat starts telling the girl he feels like a rabbit in the headlights but has to run away before it’s too late. She reminisces about the life they’ve left behind as guitar loops and strings rise from the stereo, growing, filling the car with crying guitars to fade on a haunting guitar. 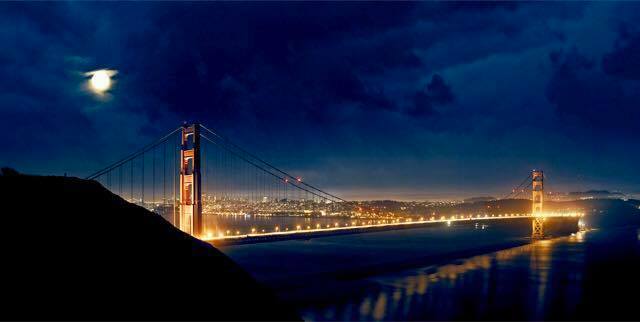 We eat up the miles of piano keys, twitching rhythms in a regular pattern, flying past San Elijo and over the waters of Batiquitos Lagoon State Marine as we draw nearer to ‘San Francisco’. I can’t hear their voices for noises of the night, maybe they’ve stopped talking for a while as we weave through traffic like snakes through a forest, percussion and keys fluttering in the warm breeze. A large locomotive hurtles by heading North, pulling carriage after carriage, must be fifty at least, mostly passenger. It’s a brief distraction as we approach Carlsbad and they turn off into the Village pulling in at an all night diner, gleaming polished chrome and neon lights. The couple get out of the car (the man has changed his clothes) and go inside. I top up the gas tank at the pump, then park further down the bays, head for the entrance and in. I sit a few tables down from them so I can still see and hear them without raising suspicion. They order and then the waitress comes over to me, asks if I’m eating alone, she’s cute but I ain’t got time for flirting. I order coffee, black and a couple of caramel and marshmallow cream do-nuts, I need to keep my energy levels up. Headlights pierce the windows then the entrance door swings open and in come four serious looking guys, in denims, hoodies and leather jackets. I know them, it’s the Cavanagh twins, singer/guitarist Vincent and bassist Jamie with troubled brother Daniel, also a singer/guitarist. They grew up amidst a violent background but are all fine musicians these days. Danny Cardoso is with them, I recognise him from a magazine shot, the article said he’s a good keyboard player. They join the two I’ve been following saying their ‘hello’s’ and it clicks, the siblings Douglas. John’s a drummer who has struggled with a drug problem and his sister Lee, with the dreamy voice, is the one who picked him up at the beach. So the old Anathema crew are back together again. I sit and listen, it’s quiet in here apart from the music in the background, a relaxed tune of guitars and keys. They talk and Lee starts singing softly to the tune and wondering “How did I get here, I don’t belong here…”. The music intensifies and I’m only getting brief snatches of conversation, mention of ‘Springfield’, but that’s way up the coast beyond Frisco, maybe they intend going there. As the music dies down they rise to leave the conversation over, though I do hear someone whisper, “They’re leaving here, and were never seen again”, best I follow a while longer and see if I can work out what their plans are. They refuel and I wait, then we wend our way back to the I-15N and continue the journey. As we do I can hear Lee start to sing again, that dame could charm the birds from the trees. I’m beginning to wonder if this maybe ain’t just a road trip but a journey of the soul, a chance to blow away ‘Ghosts’ of the past and old cobwebs leaving the future a little clearer, not just for the band but me as well. The music on the car stereo is sweet as we struggle our way through LA, I nearly lose them a few times but ‘Can’t Let Go’ just yet. I’m working things through, though I’m not sure I have many answers yet. The driving rhythm helps soothe me and picks up tempo as we gain speed heading inland through the forest parks toward Bakersfield. We’ve been travelling sometime when their two auto-mobiles swing into the lot of a motel with me following at a respectable distance. They go into reception and I watch as the music fades with only the sound of their footsteps and the doors as they take a couple of rooms for the night. I decide to sleep in the car, it’s a balmy night and my budget doesn’t stretch to luxuries especially with tolls to pay en route. Car facing their rooms I yawn, recline the seat, leaving the windows partially open, tip my hat over my face and in my imagination I can hear Lee sing, soothingly ‘Close Your Eyes’ as I do just that. I’ll sleep tonight and dream on. I wake with a start and sit upright, my hat falling into the foot-well, shaking my head to shift the fuzziness from my brain and rubbing my tired eyes. The sun is skirting the horizon on it’s ascent to day, red and orange causing a haze in the background, making it look like there are ‘Wildfires’ in the bush and scrub along the bleachers. The parking lot is empty except for my motor, think they’ve given me the slip,did they rumble me? I turn on the car stereo to a piano refrain joined by echoing harmonised voices that float from the speakers out of the window and into the warming air. The drums roll in as I get out of the car and stretch and turn in a circle, a vague attempt at allowing the light breeze to air my slept in clothes, I sure ain’t smelling of roses. As I look around the music builds, filling out the sound like a grand introduction to the glorious sunrise before me, then echoes away. The sound of waves on the shore return my thoughts to the beginning of this tale and acoustic guitar offers reflection, whilst a male voice taunts me, “You don’t understand…All I need is you”. I notice something propped on the windshield of the car and pick it up. It’s a CD. The cover is of a car at night driving towards me, making me feel like a rabbit in the blazing headlights. 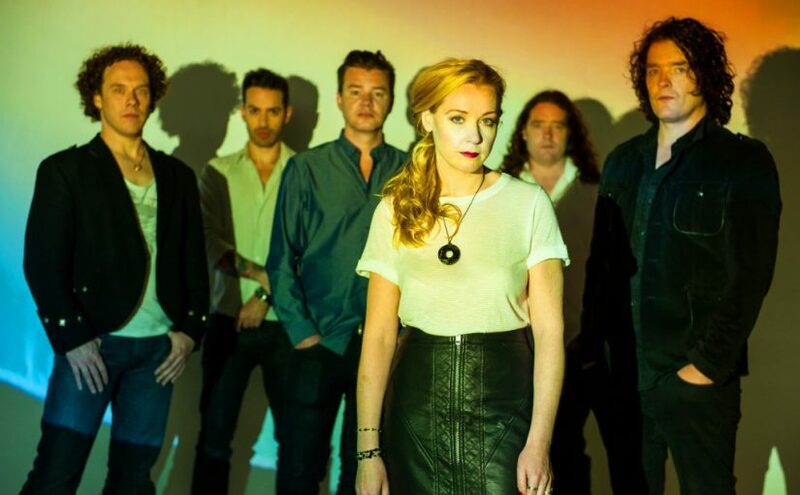 It’s Anathema‘s new one, ‘The Optimist’. Busted! They got me and now they’re gone, ah well I wish them all the best on their journey. No point in going any further I may as well head ‘Back To The Start’, besides I think I have gained enough from what I’ve seen and heard to satisfy my curiosity. The music comes to an end and there is the sound of a knock on an imaginary door, could be one in my brain. The door opens and a male voice asks, “Hi, how are you?” If it’s a question I had to answer right now, this journey has given me time to sort the dumpster in my head and I’m feeling just dandy. I get back in the car and fire up the engine, she settles to a steady rumble. I take the CD from it’s cover and slip it into the player, there’s the sound of waves and someone on the beach, the soundtrack to this journey, now there’s a surprise. I smile, engage the transmission and head back South, it’s been a ride. Wait! You were expecting answers? An explanation maybe? Not from this sap, my information on the band remains strictly confidential and what I have discovered about myself along the way highly personal. 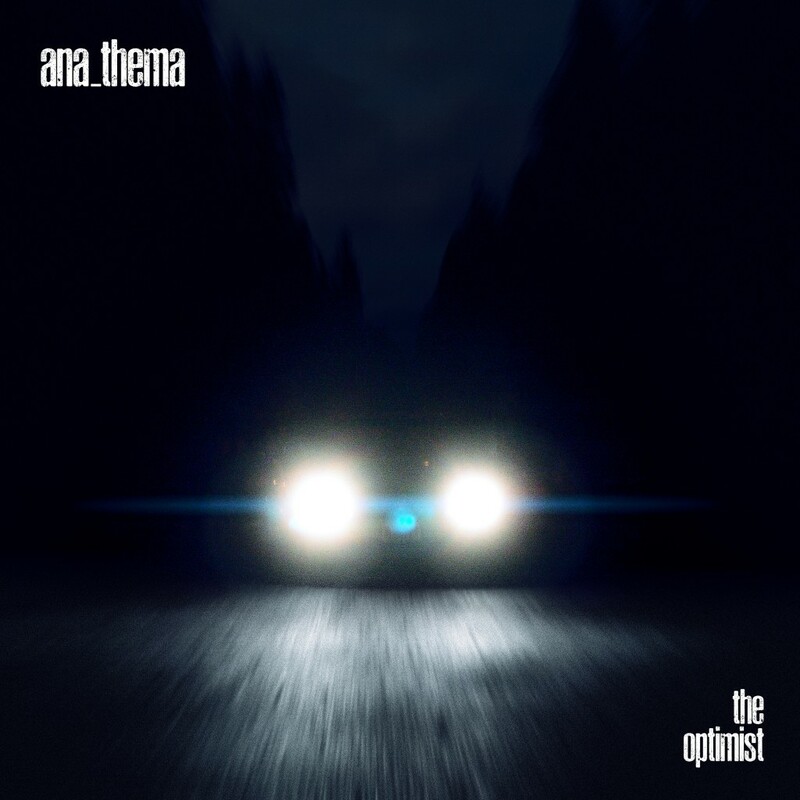 You want revelations I heavily suggest you treat yourself to a copy of ,‘The Optimist’, and discover for yourself, I’m sure you’ll find this excellent album is worth it. 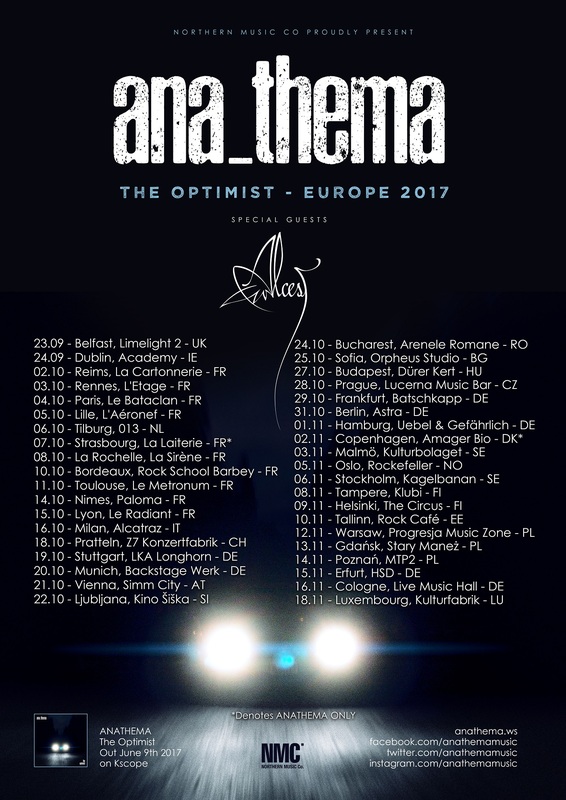 Buy ‘The Optimist’ direct from the band. 1. a person who tends to be hopeful and confident about the future or the success of something. 2. a person who believes that this world is the best of all possible worlds or that good must ultimately prevail over evil. 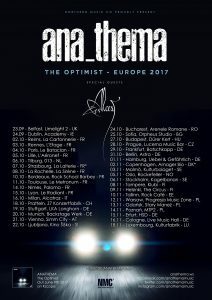 After Anathema’s 2012 award-winning album ‘Weather Systems’ and 2014’s spellbinding ‘Distant Satellites’, the ambient rockers are back with their eleventh full-length, ‘The Optimist’. 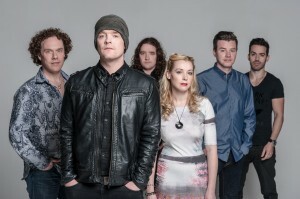 Due for release on 9th June through Kscope ‘The Optimist’ will soon reveal some of the darkest, most challenging and unexpected music the sextet have put their name to.